2012 has proven to be another eventful and rewarding year for the Foundation. We have consolidated our existing projects, continued to support over 2,000 underprivileged children’s education, basic nutrition, and basic health care, in four countries: Burkina Faso, Morocco, Thailand, and Cambodia; we have completed three major school infrastructure projects in Thailand including one Primary School, one Secondary School, and one Professional School Dormitory in Chiang Rai; we have built capacity in our project in Thailand with two new staff members; and we have officially launched the Milan Chapter and fundraising activities in Italy. In May, Pasquale Pistorio, Founder and President, was awarded the Ellis Island Medal of Honor in New York for his philanthropic initiatives. The Award recognizes individuals who help “create a better world for all of us in the future by the work they do today”. Past Medalists include US Presidents and Nobel Prize winners. In Pasquale’s words, the award “is the symbol of individuals offering other less privileged individuals hope, opportunity, and freedom.” It is a recognition that honors the hard work and commitment of the Foundation’s supporters, Board Members, Country Managers, and volunteers who continue to contribute resources, time, skills, and ideas to further its mission and cause. Burkina Faso has a very low literacy rate of 29% (World Bank), and has one of the lowest enrolment rates in primary and secondary school in the world (63% and 18 % respectively, according to UNESCO). Barriers to access to education are mainly due to lack of infrastructure facilities, but also distance to school, health issues, and poverty, among others. 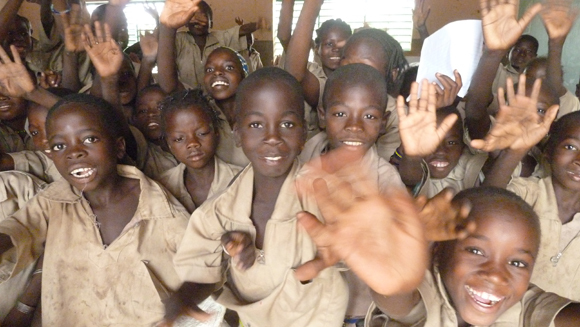 The country is one of the weakest in west Africa in terms of access to education. In partnership with the Centro Italiano Aiuti all’Infanzia (CIAI), the Foundation supports the education of 82 children at the Nibagdo Primary School, expanded by the Foundation in 2006 to accommodate more children, and 9 children at the Secondary School of Sogpelce’, built by the Pistorio Foundation in 2009, in the rural province of Boulkiemde’ in the mid west of Burkina Faso. The Secondary School caters to 13 villages, including that of Nibagdo, and now holds 470 students. The lack of existing secondary schools in the region is such that although our school can accommodate 150 new applicants every year in Grade 6, over 100 applicants are rejected. We have therefore decided to make two classes for each grade level as of 2013. We have been very pleased with the results of the Secondary School which have been excellent. Students and families appreciate the high quality of the building infrastructures, the presence of a canteen and sanitation facilities, the fact that the school is properly maintained and cleaned, and the experienced and professional teaching staff. Thanks to the high standard facilities, the school has attracted very good teachers, and it is considered today the best Secondary School in the Central/West region of the country, with the highest pass rate of 73%. In both the Nibagdo primary and Sogpelce’ secondary schools we have built wells to supply clean drinking water to the schools. The children we support receive uniforms, meals in school, medical check-ups, vitamins, iron, folic acid, anti parasites, and soap. Included in the scholarship support is also teacher training, sports equipment, and maintenance of school infrastructures. 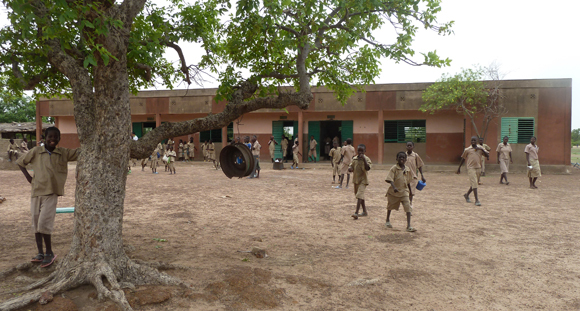 The schools are public schools that follow the national curricula, however the performance of our students are above the national average as they benefit from better infrastructure facilities, lower student teacher ratio, higher quality of education owing also to teacher training workshops conducted at the schools, as well as from access to basic nutrition via the school canteens and to basic health care. After school and on weekends, the children help their parents at home or in the fields. The girls help the mothers with domestic work, such as collecting water, washing clothes, preparing food, grinding the millet, or looking after the animals. The boys will go to the market to collect eggs or branches from the fields. As there is no light in the village, the families go to sleep with the sunset. In the morning families usually don’t have breakfast. Children have one meal in school at lunchtime and at home they commonly eat a millet polenta for their evening meal. The “Back to School Project” in collaboration with the Azrou Center for Community Development (ACCD), aims at providing a Non Formal Education to children who have dropped out of school, with the objective of reinserting them in the public school system. Our beneficiaries come from extremely poor and many times broken families. The children have dropped out of school to help support the family and because of violence by school teachers. There is over 50% percent school dropout rate in the region due primarily due to hostile school environments. Many of the children that have joined the program have been out of school for several years. The program enrolls children from the age of 8 and above. The parents of most of these children are illiterate, and some children have learned to read and write only at the center. 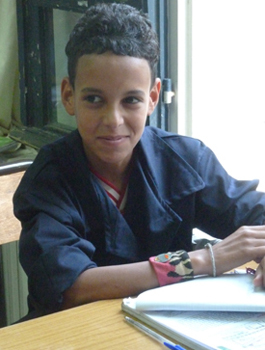 At the Azrou Center, children study Berber, Arab, French, Maths, and also have classes in music and singing. Children participate in extra curricular activities and field trips. The program consists of a two year curriculum which allows children to catch up with respect to the national curriculum. 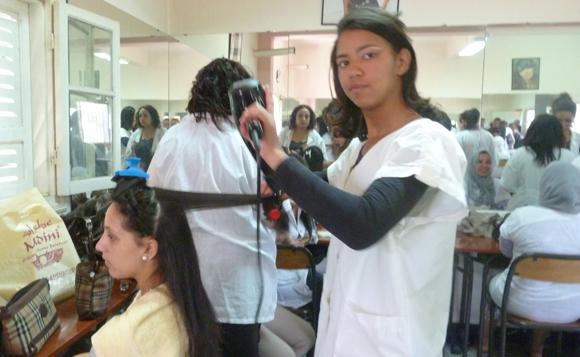 Older students also follow vocational training classes, ranging from Woodsculpting, to Tailoring, and Hair and Make Up Styling. The center also places older students in internships at local businesses and they can be enrolled in Public Professional Schools. At the center, individualized attention is given to these children on behalf of the teaching staff. The experienced teachers are particularly attentive in restoring the children’s confidence. The children are very motivated and enthusiastic, and regain self-esteem. A great achievement this year is that 7 of our students have been admitted to the Public Vocational Schools without having to pass the entry exams. This is a very positive result as they will be continuing their Professional Training Program in the public system and will be subsequently able to find employment. Along with local partners, the Foundation is supporting the construction of a new building to provide adequate facilities to the students and it will include two classrooms, one workshop room, one library, one computer room, and one canteen and kitchen. The completion of the building has been delayed and completion is now expected for the mid 2013. Hassan (14) and his sister Chouche (18) left school several years ago because of economic difficulties at home. The father is able only to work in the summer months at crop fields and struggles to pay the monthly rent. The family of seven live in a one room home of 3 x 5 meters without sanitation facilities. 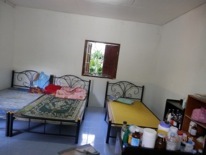 The members sleep on the floor, and the house is in dire conditions. Hassan and Chouche take part in the wood carving vocational program. 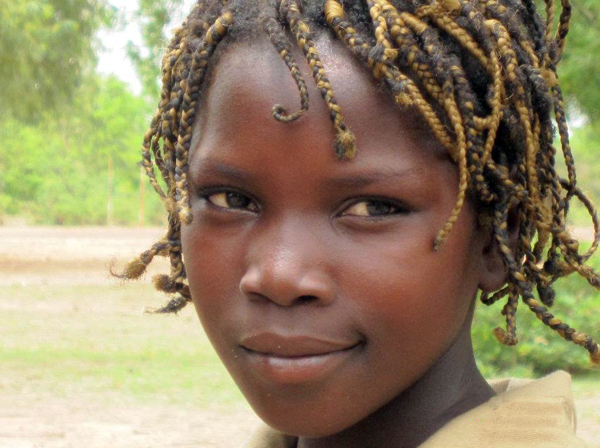 The children will spend her days off school working collecting fruits. 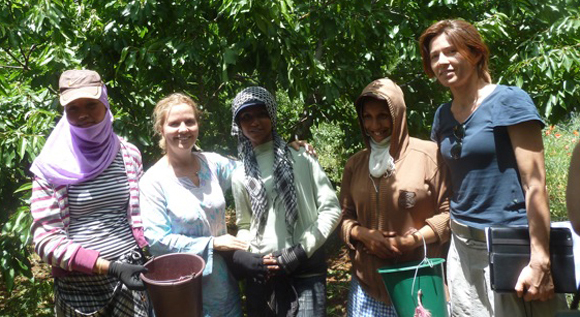 Students picking fruits on their day off school posing with volunteers Francesca Ferrari and Silvia Alfero. They work 11 hours a day with a one hour break and earn 6 CHF per day. According to Unicef, there are still 600,000 children who are out of school in Thailand, primarily those of migrants, hill-tribe minorities, refugees and the very poor. Of the estimated 1 million Hill-tribe minority population, in over 3,000 villages, (Department of Welfare & Social Development), 50% do not have citizenship because they do not have birth registration certificates (Mirror Foundation). Many hill-tribe communities still struggle with marginalization, illiteracy, poverty, malnutrition, and lack of access to medical care and education. Secondary enrollment is particularly low for hill-tribe communities, 19% only complete secondary school (Mirror Foundation). 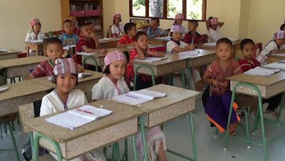 The aim of the Chiang Rai Village Project is to improve the enrollment rate of students and ensure their completion of their full schooling cycle beyond Secondary school up to Professional School. 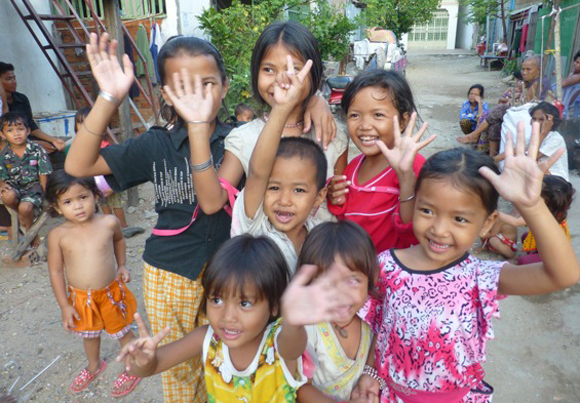 Our objective is to make sure children stay in their villages with their families. 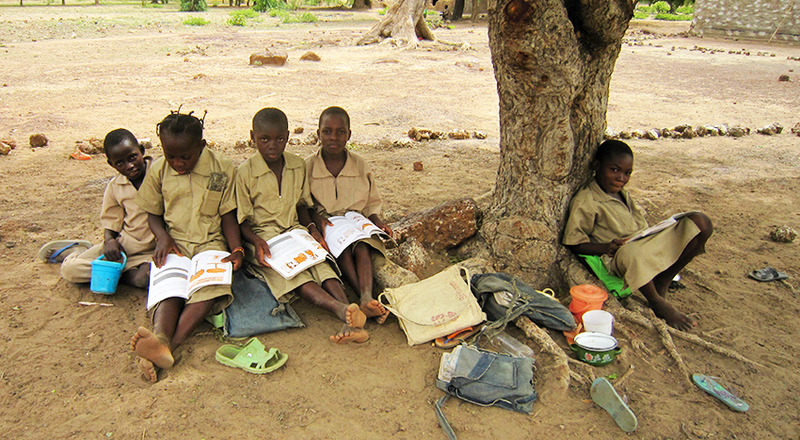 We support their education by providing all necessary school supplies and daily transportation to school. Children also receive one meal a day in school and yearly medical check-ups. In very remote villages where transportation to school is not feasible, we have built school infrastructures. To accommodate children of neighboring villages, our schools also have dormitories for children to stay during the school week. To date, the Foundation supports the education of 1811 children from Primary to Professional School. We also initiated a preschool program to support Nursery School children, providing them with supplies, soap, toothbrush, and if necessary complementing teaching staff and providing didactic material, and improving Preschools by renovating them and adding kitchen and sanitation facilities. For every village we support, we make sure that children from Primary School to Professional School have access to education. We cover costs of school supplies and uniforms, transportation, dormitory fees, and, where applicable, meal fees. Where necessary, we build clean water systems that can serve the schools and village. 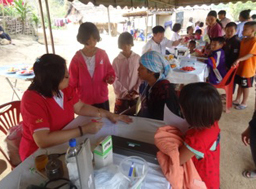 On a yearly basis, a team of doctors and nurses from Bangkok visit the villages and conduct medical visits of children and adults, and distribute anti parasite, anti worm, and anti lice medicines and first aid kits, as well as informative leaflets on hygiene measures and detection of common illnesses. 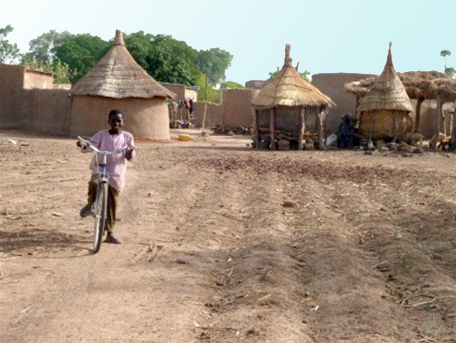 In very remote villages where transportation to school is not possible, we build and improve school infrastructure. The schools we build also include Kitchen, Canteen, Library, Computer Room, and Dormitories for children of neighboring villages. Once built, the schools are run by the government which will provide also the teachers and school staff. We also promote agricultural programs such as school farms or coffee plantation income generation schemes to further village development. The aim is for villages to become self sustainable in the course of a number of years so that households are able to provide for their children’s education and welfare. The Foundation will then reduce its support through a planned, gradual exit strategy. Our intention is to duplicate and scale up this model to more villages in the region. Somboon and Thawat posing with a group of Foundation students at the Mae Ha Pai School in Pha Taek Village. This year, the Chiang Rai Village Project has taken on two new staff members: Thawat Bekaku and Somboon Kittisirimongoon. 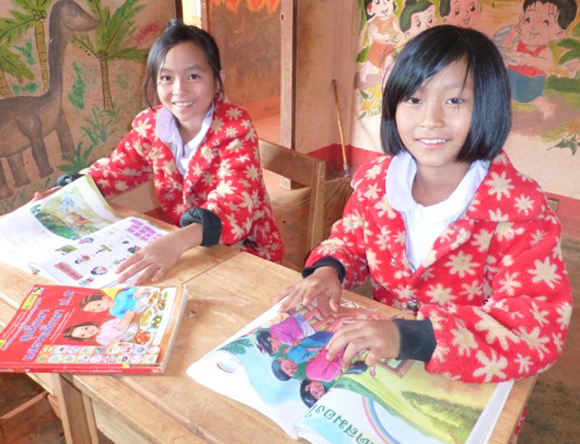 Both Thawat and Somboon are from Hill Tribe villages, Akha and Hmong respectively, and have successfully completed their university education. Our students are enrolled in a number of Professional Schools, but the majority are studying at the VBAC Professional School in Chiang Rai. The Professional School degrees which our students are currently undertaking include Nursing, Tourism and Hospitality, Mechanics, Accounting, Mechanics, Agriculture, Information Technology, and Electronics. 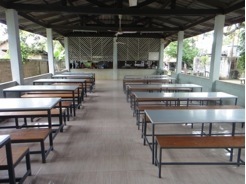 Supply of 6 tables and 12 benches to Ban Mae Ha Pa Rai Sriyangchum School Canteen to replace the existing furniture that was very old and had deteriorated. Children of four villages cater to this school. Construction of a sports field of 540 sqm for the Tako School. 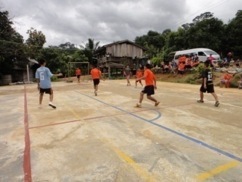 The field serves numerous villages, providing an area for exercising and for sports, as well as a space for villages’ traditional and cultural activities. 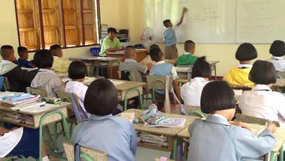 Supply 80 sets of student tables and chairs to Ban Mae Khaotom Thasut Primary School. 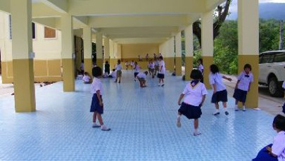 The ceramic floor tiles were installed in the school meeting room, the dormitory building and kindergarten building thanks to the generous donation of a donor in Singapore, Renato Sirtori. 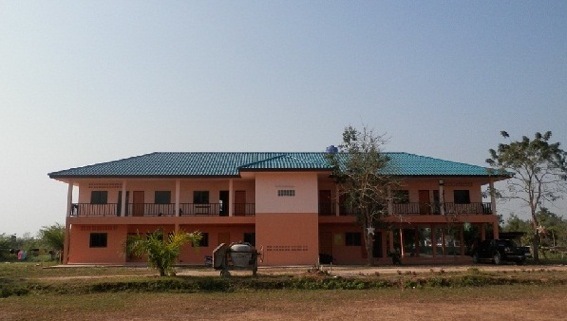 The former Primary School of Mae Pon Village has been renovated thanks to the generous donation of Alison Lim and Maarten Buitelaar from Singapore. The renovation included the remaking of columns from wood to concrete, rebuilding and expansion of the roof, replacement of all the windows and doors, tiling of all the floors and renovation of interiors, remaking of the staircase, creation of adjacent first aid room, paving a total of 600 sqm for playground and road leading from the village to the secondary school. 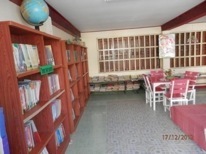 There are three classrooms for Grade 6 to Grade 9 on the upper floor, and a Computer Room, Library Room, and Office. The building was completed in November 2012 and will open in May 2013 with the new academic year. 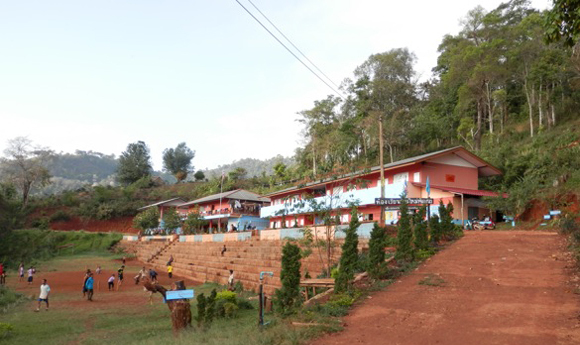 The Mae Pon Primary School was built in partnership with other local organizations in November 2012. 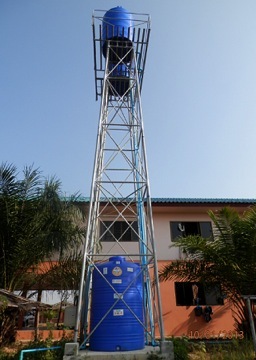 The building has three classrooms on the second and third floor and sanitation facilities. The ground floor is an open area where the children can play when it rains. It is also the school canteen area. 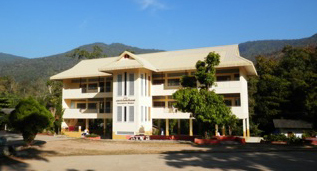 The school opened in November 2012 with 159 students. 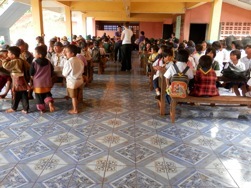 The school can hold up to 200 students. Construction of Boarding Facility for 80 students at VBAC Professional School Chiang Rai campus. The building was completed in April 2012 and currently houses 60 students. The Foundation has 180 students attending VBAC. The rest of the students are housed in three other dormitories built in the past years by the Foundation and other donor organizations. 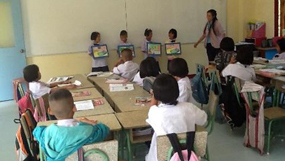 Mobile Program: A team of doctors and nurses from the Camillian Hospital in Bangkok visited 11 villages and one boarding school, screening over 1,000 children and adults. A few months later, volunteer paediatrician Paolo Bertolani accompanied by our staff went to other villages we support and screened nearly 600 children and adults. Families were also trained on hygiene, nutrition, and healthy lifestyle habits. Saetern is 10 years old, she is in Grade 3 in Ban Mhai Pattana’. She loves studying and has just started taking English classes. She likes her English teacher very much. 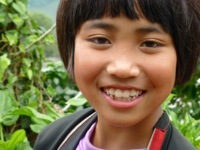 She has 6 siblings and her parents work on the coffee plantations. If there were not a school in the village, she would not be able to go to school. Janurjee is 19 years old and studying IT at the VBAC Professional School in Chiang Rai. When she finishes she wants to enroll in University. She is from the Yao Hill Tribe. She has three siblings and her parents are farmers. Had she not had the opportunity to attend Professional school, she would be working in the village in the fields with her parents. When she grows up she wants to help her village. She is convinced education is the best way to help her village community. The Pistorio Foundation supports the scholarships of 84 street children and children that were former dump laborers in Phnom Pehn, scavenging for plastic to sell to recycling companies, at the Catch Up School and Professional Schools of Pour Un Sourire d’Enfant (PSE). The children arrive at 6.30 am at the Center so that they can wash, get dressed, and have breakfast before the start of school, and they will stay at the Center until 6.30 pm, so that in addition to the Lunch Meal, they will also receive a snack and after school tutoring by teachers. Children also receive access to medical care thanks to the in house clinic and as part of the scholarship, parents receive an allocation in rice to deter parents from sending the child to work. Students at the Catch Up Primary School at PSE complete two years of schooling in one, through a recognized accelerated program. This is for children who have been out of school for many years, or who are older and have not yet been in school. Students in secondary school are placed in public schools to avoid duplicating the work of the public school system. The children and the quality of education is closely monitored. In general, low wages of teachers in public schools engender a corrupt system whereby teachers will demand daily tips from children and the poor children that are unable to pay will be academically penalized by the teacher. Children who find themselves already in precarious socio economic conditions and strained family situations, will be at higher risk of dropping out of school altogether. The scholarship program includes a compensation in teachers’ salaries to counter this phenomenon. Rice compensation, teacher salary compensation, a greater number of meals a day distributed to children, afterschool activities, and additional support from social workers to monitor the attendance of school children and work with families to ensure their cooperation, accounts for the greater cost of scholarships compared to Scholarship Programs supported by the Foundation in other countries. In addition, the Scholarship for a Professional School student is nearly twice that of the Primary or Secondary School student, because the entire programs, teachers, and classroom and workshop facilities are sustained by PSE at the PSE center. The PSE Professional Schools are reputed to be the best in the country and therefore ensure best work placements for graduates. The government has asked PSE advisory help in rolling out a plan to create vocational schools around the country. The success of PSE graduates is a further factor that helps motivate very low income families and their children to pursue an education with PSE. The level of education at PSE, confirmed also by the pass rate and results at national exams, is well above the national average. 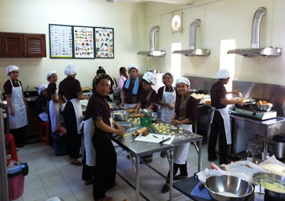 With the exception of 1 student of whom we have lost touch, all the students who have graduated since 2009 are now working in reputable organizations or businesses in Phnom Penh. Our beneficiaries that have completed Professional School are now working in the following fields: Tailoring, Baking and Pastry making; Gardening; Housekeeping; Childminding; Hair Styling and Spa; Plumbing; F&B Service; Masonry; and Cooking. Students who graduate are able to help support their family and join with other Alumni to form an advocacy group and a network that strengthens their relationships and support system. 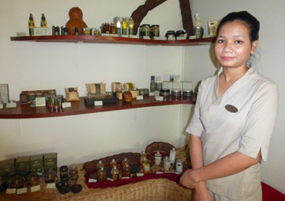 Srey has now been working in a reputed SPA in Phnom Penh for two years as aesthetician after graduating from Professional School. She earns more than three times the salary of her mother and the employer also provides housing and meals for Srey and the six other employees who share an apartment. She is able to send 90% of her salary to her family. 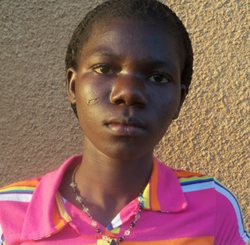 Her income helps support her five siblings. Her father is ill and does not work. Her mother works as a scavenger for plastic and earns 2$ a day on average, but half of this goes into transportation to reach her workplace. She must pay 15$ a month for the rental of their room on the second floor. 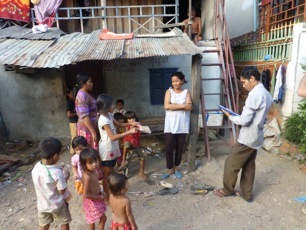 In the photo below is Srey’s home and mother. The Singapore Chapter raised 109,428 SGD this year, 100% of which have been used directly to fund scholarship and school infrastructure programs in Thailand for underprivileged hill-tribe minorities. The highlight of the fundraising effort was the Gala Dinner of November 1st, held at the Shangri-La Hotel. 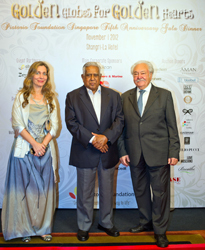 The event was graced by Guest of Honor, former President of Singapore SR Nathan. HE the Italian Ambassador Anacleto Felicani and HE the Thai Ambassador Marut Jipatima were also present. Emceed by vocal artist Amy Azyza, the event featured dazzling performances by the Cheng Ballet ballerinas and by six time Ballroom Dance World Champion Mirko Gozzoli and Lily Cashin. The event was topped by DJ Victor Repkow. Our deepest gratitude extends also to our Event Partners Arca Dance, Repetto, International Dancers for Humanity, the Cheng Ballet, and our corporate sponsors Cerulean Business Partners, Keppel Offshore and Marine, Mastercard, Shufong Trading, Union Bancaire Privee, and STMicroelectronics; to our auction donors Audemars Piguet, Ravi Paul Abraham, Aman Resorts, Small Luxury Hotels, Autium, Asiatique Collections, Base Entertainment, Bluebell, Dagmar Jewellery, Emilio Pucci, Greenprints, Gaia Restaurant,Georgie Ohlsson, Hashi Japanese Restaurant, Hilco, La Perla, Love Moschiono, The Orientalise Carpets, Duepunti, Anya Hindmarch, Pepenero Restaurant, Pirelli, Sabiana Paoli Art Gallery and Ludmilla Kazinkina, Vive Ninette; to our sponsors Zardoze, Acquapanna San Pellegrino, Alfero Gelato, Autoctonous Wines, Bata, FBI Wines, Huang Yao Foundation, Ikebana Chapter 135, Italian Trade Commission, Perfetti, Sabiana Paoli Gallery, Sudio 36, and Swarovski Elements. Thanks to the contribution of Dean Harman of Doh Productions who produced pro bono the video “Message from the Founder” in Singapore. the Yard Sale of John, Debbie, Angelina, and Adam Saliling, which raised 660 SGD for our cause; the presentations of sixth graders of the Canadian International School, Mark Podmore, Charlotte Li, Mujahid Aleem, Hana Ito, and Nathan Jong, who documented our projects as part of their Primary Years Program Exhibit; to the book donation by Huang Yao Foundation which has helped raise over 1,200 SGD; to Amy Azyza’s generous donation of 600 SGD on the occasion of her birthday as donations from her friends; and to Ornella Fumagalli of the Milan Chapter who has raised over 110 Euros in sale of hand made jewellery from women of a hill-tribe village. We would also like to acknowledge our In Kind donors: Gianluca Lionetto of Tennis Tonic for the donation of sports equipment for our primary school; Evelina Camilleri, Sarah Meisch, Mercedes Hamilos, and Peggy Khoo for the donation of clothes, children’s books, and soft toys for our preschool and primary school students; GlaxoSmithKline donation of caps and cloth bags. The shipping of 100 kg of in kind donations was made possible thanks to the generous sponsorship by DHL. Finally, many thanks to Bata for the donation of 500 pairs of shoes to our students on scholarship!